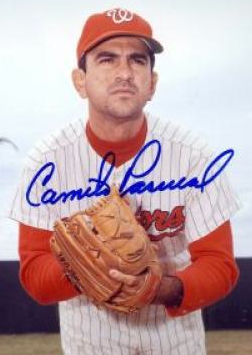 Master of the curveball and 5-time All-Star, Camilo Pascual showed uncommon durability for a strikeout specialist, totaling 18 major league seasons and becoming just the 13th man to collect 150 career wins and 2000 strikeouts. Few pitchers manage the feat then or now, even in an era of free-swinging hitters and better physical conditioning (full list at B-R). 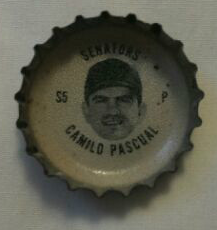 Camilo's also one of a handful to play for both Washington Senator franchises. He debuted in 1954 and followed the first version to Minnesota when they moved west in 1961. The Twins then traded him back to the "expansion" Senators prior in late 1966 and all but two of his 174 career wins came wearing a Washington or Minnesota jersey (career stats). I prefer the Senators long-sleeve-red-under-pinstripe. 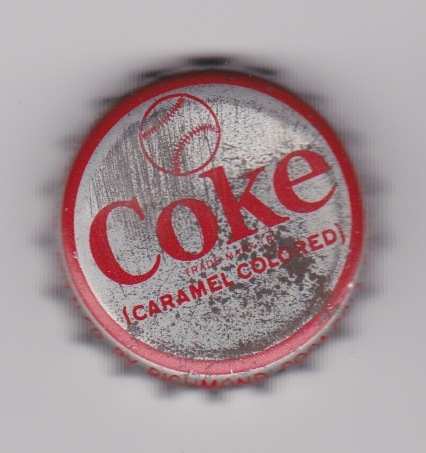 Coke added players for most teams to their bottle caps for 1967, but cut back to just a handful (and no Washington) for their 1968 series. See also Fleer Sticker Project's profile of the Coke overlaps with Dexter Press, another early set licensed by the emerging Major League Baseball Players Association. TRIVIA: These nine guys played for both the pre- and post-expansion Washington Senators. BONUS TRIVIA: Hector Maestri appeared in two career games, 1 for the 1960 Senators and 1 for the 1961 Senators (career stats). He technically moved with the Twins after 1960, but Washington selected him during their expansion draft. Value: This #5 cost $3 on eBay. Most caps (a.k.a., crowns) turn up for a dollar or less at collector shows. Fakes / reprints: Can't imagine how someone would fake a Coke cap and it'd be interesting to see someone try.